Frequently appearing in front of a camera and having their photos snapped, celebrities often cake on makeup to hide any traces of flaws and to ensure that they are camera-ready. Female celebrities, especially, would apply a full face of makeup on their days off when out in public to avoid being caught on camera looking dull and tired. Tracy Chu (朱千雪), however, is an exception. Recently, the 30-year-old actress was spotted out in public bare-faced and with no makeup. 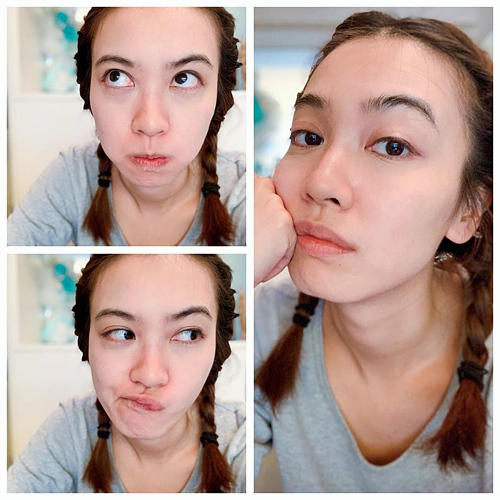 Netizens were pleasantly surprise to see that Tracy, when bare-faced, still looked vibrant and did not appear too different from her dolled-up look.